Baggage Capacity 134 cu. ft. The 2000S is built on the traditional and capable Falcon 2000 platform and inherits the same features as other models in the long-running Falcon 2000 series. Over 500 of the widebody aircraft are in service around the world, making it one of the most successful twin-engine models in flight. The 2000S is capable of a 554 miles per hour airspeed and a range of 3,613. 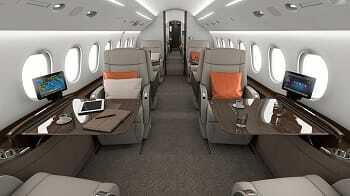 Dassault business jets model 2000S offers equal roomy cabin dimensions similar to the Falcon 2000. The maximum cabin width is 7.7 feet, with a cabin height of over six feet, and interior length of 31 feet. Expanded from the Falcon 2000, the standard seating configuration features a passenger capacity of 10. Alongside the new cabin space interior, the 2000S comes standard with the FalconCabin HD+ cabin system management. Lights, media, and interior temperatures are controlled via an application system and are viewed on 19-inch widescreen monitors. 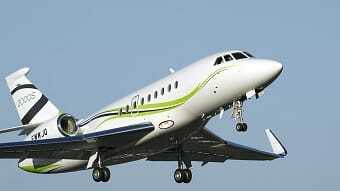 The Falcon 2000S is a modern and spacious private jet charter with many advantages. The aircraft offers a baggage capacity of 134 cubic feet for the comfort and convenience of our guests.